In a previous post, I addressed the technical issues faced by cellists with "double-jointed" (more correctly, hypermobile) left-hand fingers. An equally common problem that you'll see on cellists with otherwise decent bow-hold setups is a hypermobile right fourth finger that "buckles" on the bow. 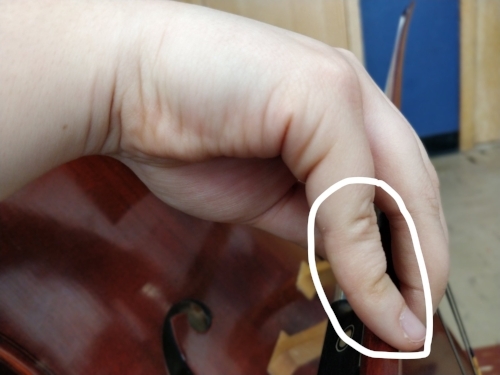 This "collapse" isn't so much caused by the person's hypermobility, but by a misconception of what the fourth finger is supposed to do on the bow, in combination with finger shaping that places the finger on the bow in a way that's likely to cause buckling. What do I mean by "misconception"? Well, I've heard a lot of teachers say that the index finger, fourth finger, and thumb are the fingers that "hold the bow up" so it doesn't fall. I disagree. The force of gravity is on our side: the string is what prevents the bow from falling; the fingers are there to be guides more than holders. In most cases, the fourth finger can sit relaxedly aside the ring finger without overworking. The second part of this is the hand and finger shaping. 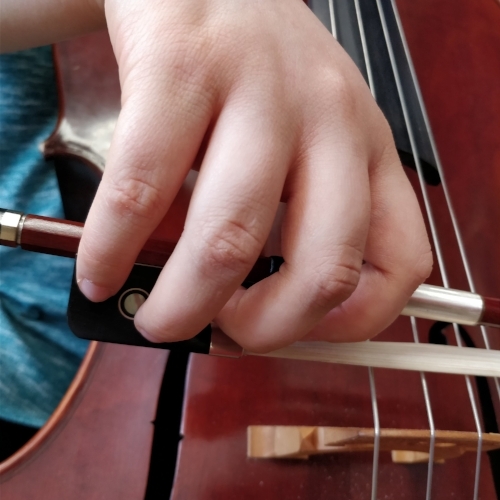 Buckling happens when the cellist's finger touches the bow at a sub-optimal part of the finger, as shown in this photograph of one of my students, J. Unlike me, J. has short arms and small hands, and in this photo she is demonstrating how she used to "compensate" by pushing the top joint of her fourth finger on the stick, causing it to buckle. Some people find this painful and some don't; either way, it's tense and we ought to avoid it. There's a very simple solution to this very common problem: don't play with flat hair! In the next picture, J. angles the stick towards her so that the bow's hair appears to be "pushing down" to the bridge (this has the by-product of improving tone quality). She's allowing the top joint of her fourth finger to come down the frog a bit so that the tip of her finger nestles in the hollow in the front of the frog. That way, a cellist can maintain good hand shaping without buckling the joint. I sometimes joke that this bow-hold has such a rounded position, you could take the bow out of the student's hand and replace it with a banana!